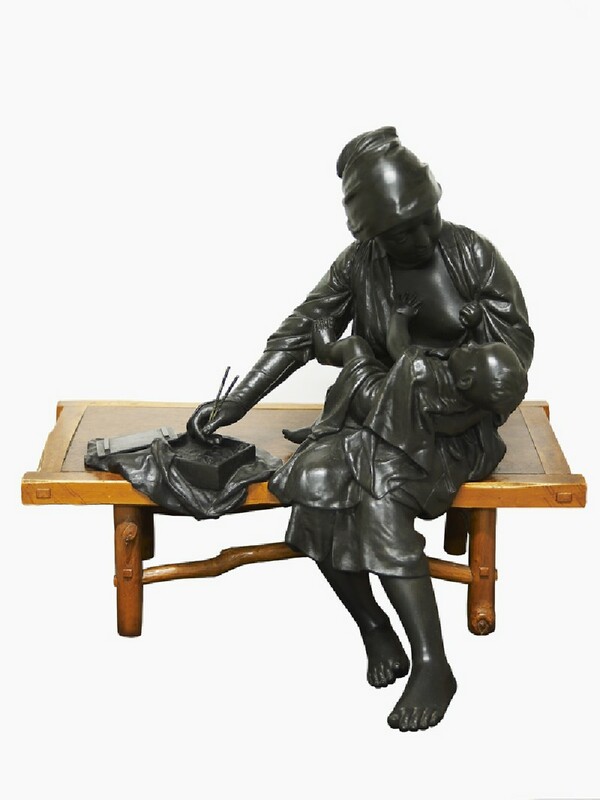 Bronze figure of a woman cradling a baby on her knee. She holds chopsticks in her right hand and is stretching out to reach a food box (bentō) containing rice, placed on a cloth beside her. She sits on a rustic wooden bench with her bare feet on the ground. Signed underneath: Udagawa Kazuo saku. The mother has presumably just finished breast-feeding her baby, and is now eating her lunch from her bentō box. The naturalism sought by the sculptors trained at the Tōkyō Art School, where Natsuo [EAX.3852] and Shōmin [EA1998.220] taught traditional metalworking skills, was much influenced by the Italian sculptor Vincenzo Ragusa (1841-1927), an oyatoi gaijin, one of the foreign 'experts' invited by the Japanese government to advise on various western skills. Carving in wood and ivory was taught, as well as casting in bronze. Udagawa Kazuo seems to be unrecorded except for his authorship of this fine bronze, examples of which were exhibited in the St. Louis in 1904 and in the Japan-British Exhibition in London in 1910.